What is SimmAgents and how does it work? SimmAgents is a web aplication that allows the Call Center Agents to use a extension without exclusivity. Each Agent logs with its own user from the web interface of the system to receive calls or pause the user. Once it is finished, it is simply logged out so that the extension become available for another Agent or if he logs into another telephone, it is automatically disconnected from the original extension. You can free download the software from https://simmlicences.com/download/simmagents_installer_64bits . All SimmLine products have a trial version for 15 days, without any restriction. The first time it is accessed, the product activation key will be requested. This key will be sent via email when purchase a license, or when activating the trial version. 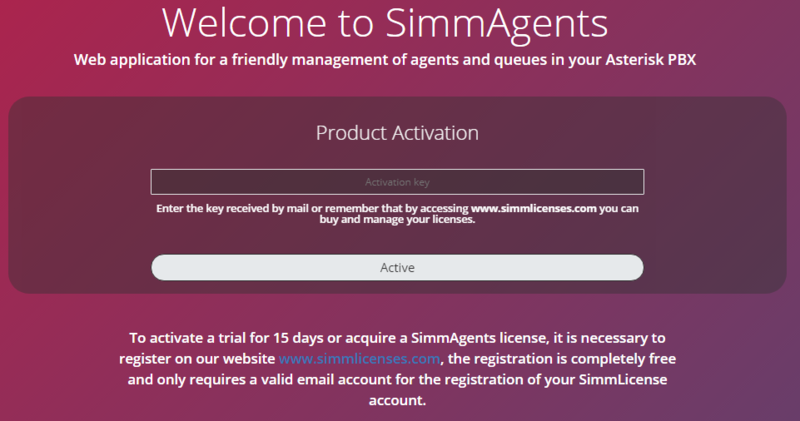 To activate a trial for 15 days or acquire a SimmAgents license, it is necessary to register on our website www.simmlicenses.com, the registration is completely free and only requires a valid email account for the registration of your SimmLicense account. SimmAgents is composed of two sections, one for agents login and another for administrators login. If this is the first time you start SimmAgents, you can only log in to the administrators section, since there are no agents yet created. For greater security, it is recommended to modify the password provided by default. After successful login, you will be presented with the main panel window. Users will be able to see on the left of the screen the options menu of the platform, and an overview of the current status of each agent. Possible states are: login, logout and paused, each state is represented by a box. The users that have the permission enabled (“Access to Login, Logout, Pause and Unpause of agents”) can modify the status of the agents by clicking on the corresponding buttons. LOGIN: when you click, you will be asked to enter in what extension the agent is logging in and in which queues. It is possible to log an agent in more than one queue, entering the queue number separated by semicolons (;). PAUSE: when you click, the agent’s status will change to Pause. By the time the agent is paused you will not receive calls. UNPAUSE: when you click, the agent will be active again and start receiving calls again. 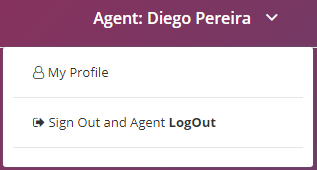 LOGOUT: when you click, the agent is logout from the queues. From the configuration menu, users can configure the general parameters of the system and access the management of users and user profiles. From the general parameters, users will be able to establish the company’s data, define a numbering range for the creation of agents and queues, and define the data for the connection with the Asterisk Manager Interface. Most fields are self explanatory, such as name, address, etc. The Language field, defines the language, the system will be displayed globally (for all system users). Currently it is available in three languages: Spanish, English and Portuguese. Agents and Queue creation, when establishing a rank for the numbering of the agents and the queues respectively, the available numbers are being delimited, in this way it is sought to avoid that when creating an agent or a queue a number is entered by mistake that is being used in an extension or group of the PBX. Asterisk data, by default when SimmAgents is installed an AMI user is created with the values shown in the fields, Host, User and Password. If you want to change the user of the Asterisk administrator interface, the password must be modified first and then follow the steps HERE for the creation of an Asterisk Manager Interface user. It is a group of permissions that determines what access and actions each user can make within SimmAgents. 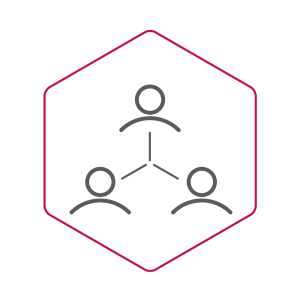 Each user can belong to a group and each group can be shared by several users. By default SimmAgents have created an Administrator User Profile that can not be deleted and that has access to all platform functionalities. The use is direct. You can click on the + Create Profile button to insert new records or click on the action buttons of each record to edit them, delete them or define the permissions. There is a search box that allows you to search for any string or number. By clicking on the button it is possible to establish which accesses and actions will be enabled for the selected profile. Users are all people who need access to the system and who want to have a personalized record of the accesses and actions that can be done. The use is direct. You can click on the + Create User button to insert new records or click on the action buttons in each record to edit or delete them. There is a search box that allows you to search for any string or number. The administrator user, like the Administrator Profile, is created by default and can not be deleted. The expiration field determines the period during a user will be active. Each time the user enters, the system will check if the user is within the determined period. In case of leaving the field blank, the user will not expire. This section allows you to create, modify and delete agents, queues and pauses. For a better experience when configuring the platform, it is recommended to first create the queues and then the agents. The queues must be created respecting the same numbering with which they were created in the PBX. 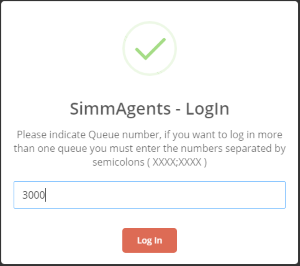 The queues created in SimmAgents are not automatically created in the PBX, nor vice versa. The use is direct. You can click on the + Create Queues button to insert new records or click on the action buttons in each record to edit them, delete them or assign agents to the queue in bulk. There is a search box that allows you to search for any string or number. 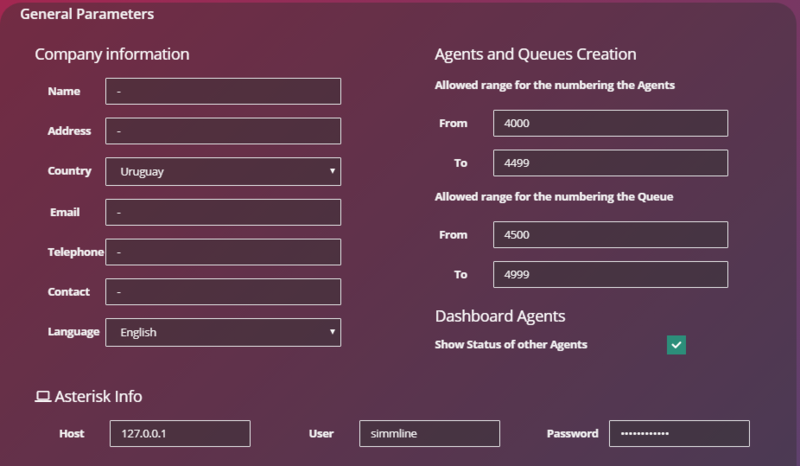 1- From the interface of creating an agent, at the moment of registering each agent, the system will allow us to indicate in which queues we can log. 2 -Or from the action Assign Agents to the Queue, in which all the agents that are created in the system will be shown and by means of the selection or demarcation, we will be indicating which agents can log into the previously selected queue. The use is direct. You can click on the + Create Agent button to insert new records or click on the action buttons in each record to edit or delete them. There is a search box that allows you to search for any string or number. For the creation of each agent, it is necessary to define a number (unique for each agent, and can not match any extension, group or queue of the PBX), a name, a key and in which queues it will register when it is logged on the platform. The use is direct. You can click on the + Create Pause button to insert new records or click on the action buttons in each record to edit or delete them. There is a search box that allows you to search for any string or number. The pauses allows users to establish the reason why the user stopped being active for the queue in a certain period. When an agent goes into pause, incoming calls are no longer assigned by asterisk to that agent. Activity by Agent report shows the activity of each agent, in a given period. You can see the detailed information of each agent by displaying the corresponding tab. If one of the Login lines is analyzed, it can be observed: date and time of login, what queues were logged, and from what extension did it. The information shown may vary depending on the event. Within the tools menu we can access the Import of Agents from an external file in format .Txt or .Csv. The tool allows you to create an agent or modify it in case there is a record with the same number. 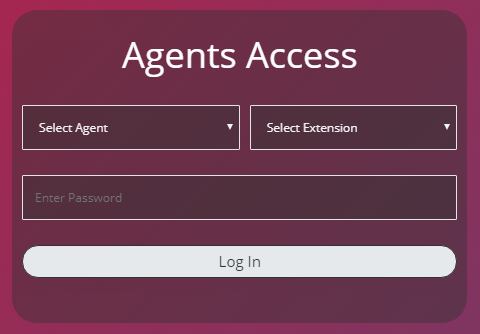 The Agents login is done by selecting the agent and the extension where it is located at the time of login. The password is specific to each Agent and is defined during the creation of each agent. The available extensions are taken from the PBX, and correspond to the telephones that are registered and active in the central. 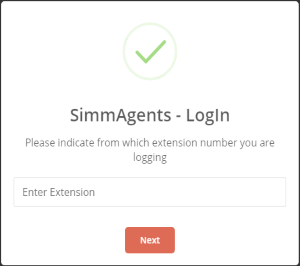 SimmAgents will make a call to the extension and will play an audio message indicating “Agent logged in”, thus confirming the correct login of the agent. After logging in correctly, you will be presented with the main panel window. 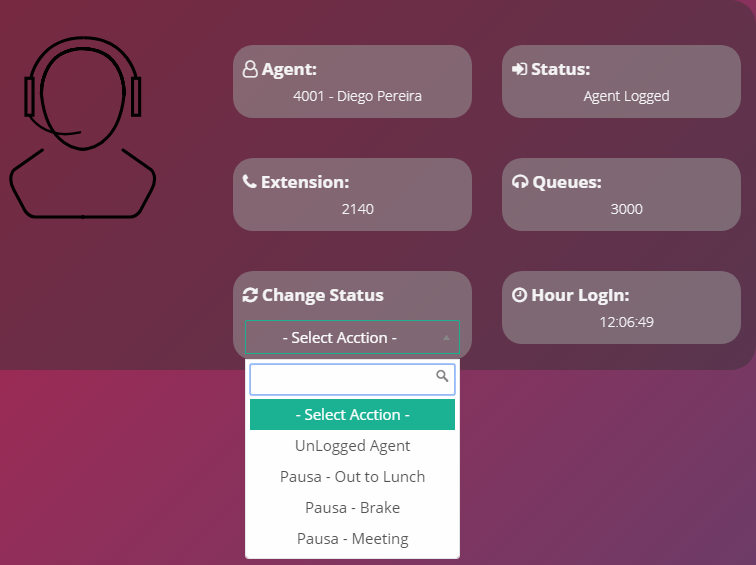 The dashboard is the panel of the agent with the main information of it: the name and number of the agent is displayed, to what extension it is logged, the state (which can be logged or paused), what queues are logged, the time of the log in and the possibility of pausing or logout agent. 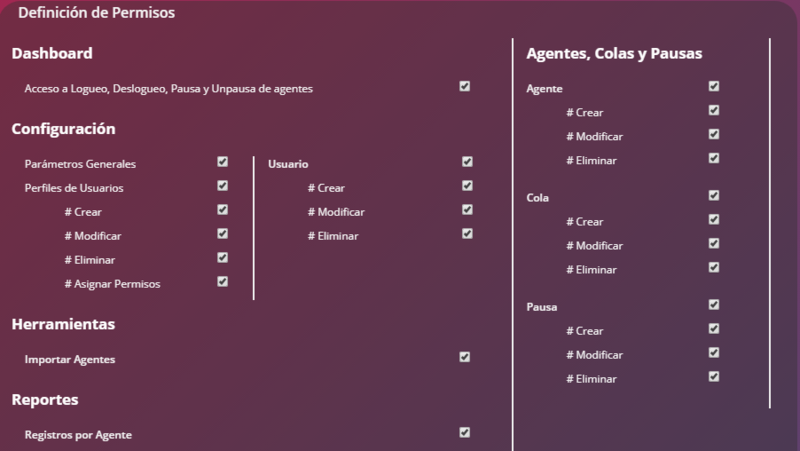 On the right side of the screen, you can see which agents are logged in, in what extension and the current status of each one. If you do not want to show this from the agents, remember that by accessing the Administrators Menu, Configuration / Preferences, it is possible to modify the Show Status of other Agents property. It is also possible to call the agent by clicking on the button located to the right of each agent. 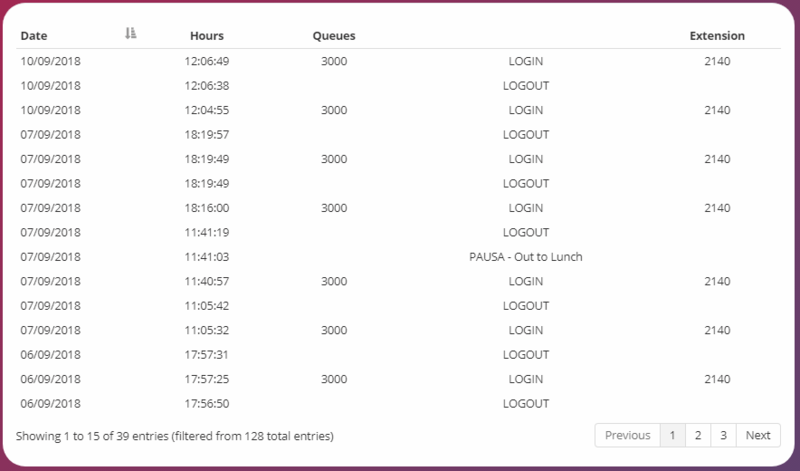 In addition to the Dashboard, agents can access the activity history, which indicates when they were logged in, the breaks made and the extensions where they were registered. In the upper right corner of the window, the name of the agent is highlighted and the Profile can be accessed from where you can modify the access password to the platform or close the session, which in addition to closing the platform, disconnects the agent from the queue. If you want to close the application but not logout the agent, you only have to close the browser tab corresponding to SimmAgents. If you have any questions about the steps detailed in this document, contact us support@simmline.com we will gladly help you.